In forty years as a photographer I've shot the high and mighty, the rich and poor, and the good and the bad. 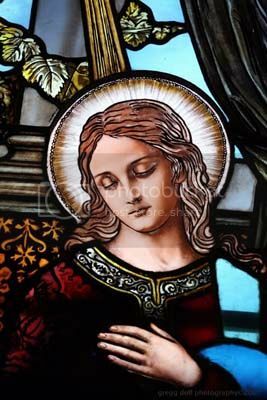 But I've never had the chance to participate in anything as historic to the lives of the people of this part of Cambria County as the making of a saint. 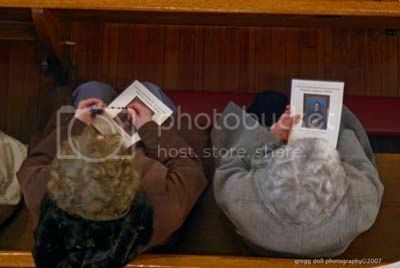 Even though we are not Catholic, or even religious for that matter, we had planned to go, watch and maybe learn something new. I was also fortunate enough to be the photographer for the Johnstown Tribune-Democrat covering these proceedings. 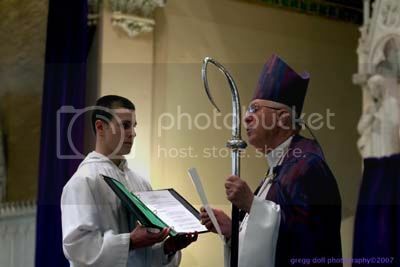 The pictures shown here are from just one-third of the ceremony that took place, and was the only one open to the general public. 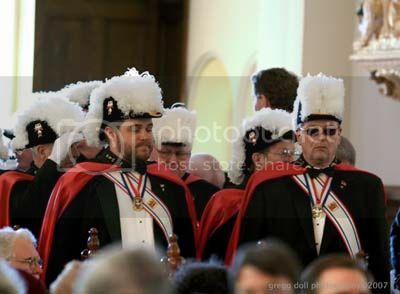 I hope that these pictures convey to you some of the pomp and circumstances that went into this festive day for the Seymour familey, the people of Loretto and the Diocese of Altoona Johnstown itself. Father Gallitzin (1770-1840) is only the eighth American Catholic nominated for sainthood. For more information, please follow the links. 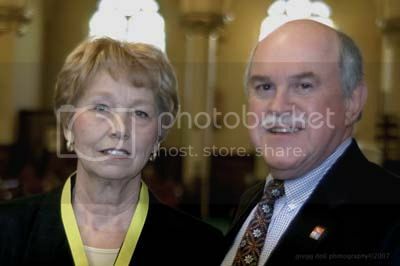 Betty and Frank Seymour, members of the Prince Gallitzin Historical Association, have spent many years studying the impact of Prince Demetrius Augustine Gallitzin on the area. 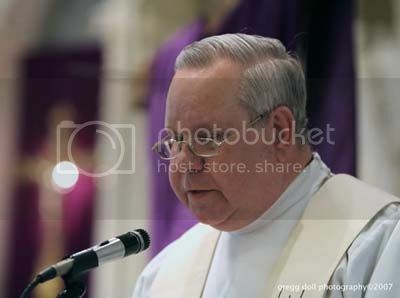 Their understanding will play a major part in the canonization process. 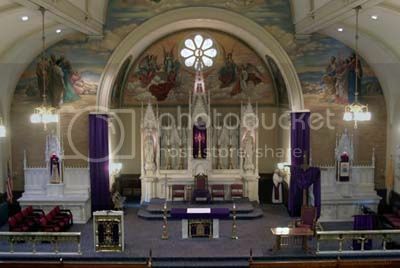 The altar area of the Basilica of Saint Michael the Archangel, Loretto, Pennsylvania. 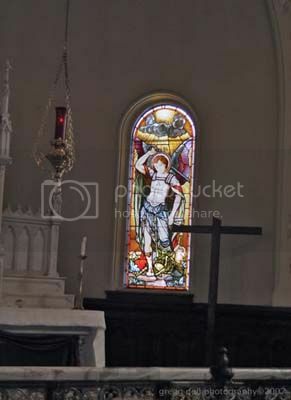 St. Michael stained glass window. One of the stained glass windows on the south wall. 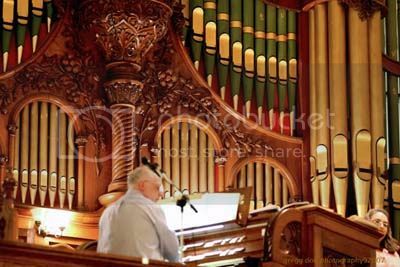 This organ was a gift of Andrew Carnegie. It is the only part of the church not paid for by Charles Schwab. For those of you not familiar with Loretto, steel magnate Charles Schwab had a summer home in Loretto and contributed thousands of dollars to the infrastructure of the village, and Saint Francis University. Looking down from the choir loft. 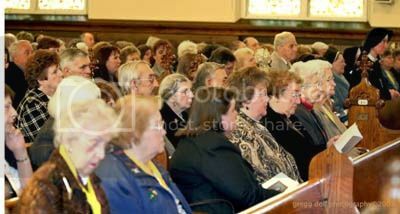 Just part of the early birds who started to fill St. Michael's an hour before the ceremonies were to begin. 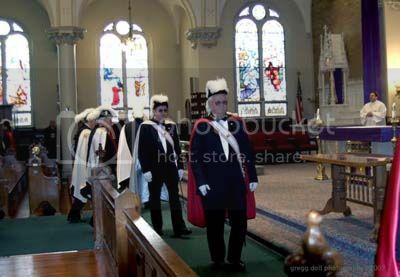 Knights of Columbus lead the procession of church dignitaries down the center aisle. 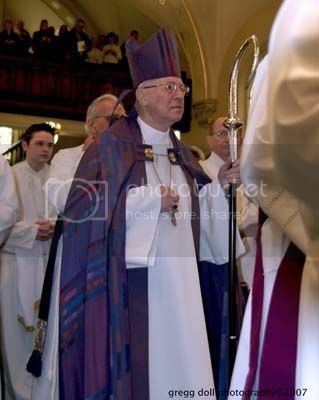 Most Reverend Joseph V. Adamec, D.D., Bishop of the Roman Catholic Diocese of Altoona-Johnstown. 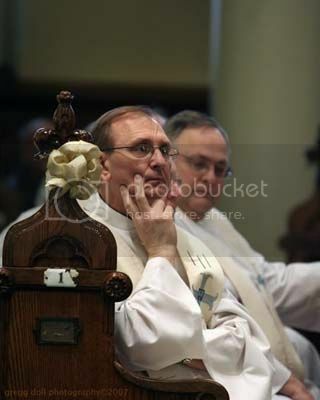 A priest listens intently to the remarks of the Bishop. 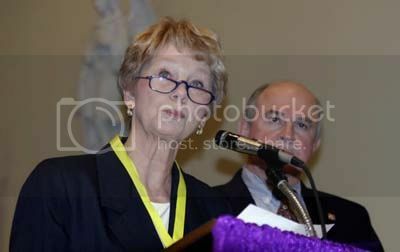 Betty Seymour reads the recommendation of the task force for the Canonization of Father Gallitzin. 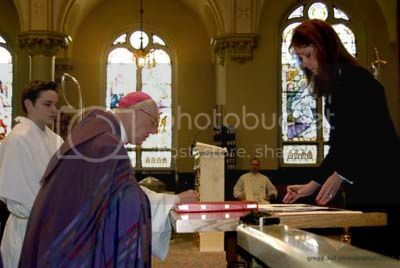 Bishop Adamec signs his oath of Secrecy, Fidelity and Confidentiality in the presence of Notary, Teresa Stayer, Chancellor. 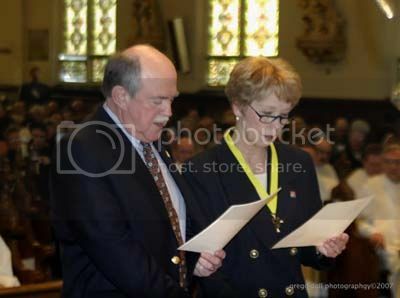 Frank and Betty read their oaths. 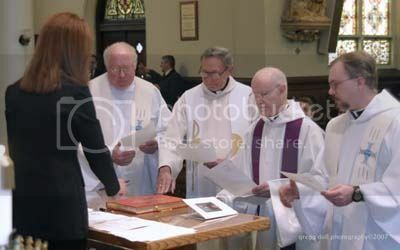 The Theological Commission -- Reverend Monsignor Timothy Swope, V.F., Rector, Very Reverend Father Christian Oravec, T.O.R., Reverend Father Demetrius Dumm, O.S.B., and Reverend Father John Slovikovski -- take their oaths.